A series of benzimidazole derivatives was developed and its chemical scaffolds were authenticated by NMR, IR, elemental analyses and physicochemical properties. The synthesized compounds were screened for their antimicrobial and antiproliferative activities. The synthesized benzimidazole compounds were evaluated for their antimicrobial activity using the tube dilution method and were found to exhibit good antimicrobial potential against selected Gram negative and positive bacterial and fungal species. The compounds were also assessed for their anticancer activity exhibited using the SRB assay and were found to elicit antiproliferative activity against MCF7 breast cancer cell line, which was comparable to the standard drug. Antimicrobial screening results indicated that compounds 1, 2 and 19 to be promising antimicrobial agents against selected microbial species and comparable to standard drugs which included norfloxacin and fluconazole. The anticancer screening results revealed that compounds, 12, 21, 22 and 29 to show the highest activity against MCF7 and their IC50 values were more potent than 5-fluorouracil. The emergence of antibiotic-resistant microorganisms such as fluoroquinolone-resistant Escherichia coli, Streptococcus pneumonia, carbapenem-resistant Klebsiella pneumonia, vancomycin-resistant enterococci and methicillin-resistant Staphylococcus aureus is becoming a serious health issue worldwide. There is a critical need to develop new chemotherapeutic agents with different mechanism of action . Cancer is a deadly disease prevalent in both the developing as well as the developed countries. In spite of significant improvements in recognition and treatment of cancer, the incidence of certain types of malignancy is still on the rise. Current treatments such as cytotoxic chemotherapy and radiotherapy yielded only transient therapeutic aids that are accompanied by severe adverse effects. This is due to their toxic effects against normal growing cells. Concerted effort is, therefore, required to eliminate or at least reduce these incidences significantly . Recent findings suggest that substituted benzimidazole derivatives possess potential chemotherapeutic activity with reduced toxic effects. Antibacterial activity of substituted benzimidazole derivatives can be explained by their competition with purines, an integral part of bacterial strain, resulting in inhibition of bacterial nucleic acids and proteins synthesis . Compounds containing benzimidazole moiety such as thiabendazole, parbendazole, mebendazole, albendazole, cambendazole and flubendazole had also been reported for their antihelminthic activity. Similarly, the proton pump inhibitors, omeprazole, lansoprazole, rabeprazole, pantoprazole, had been reported for their use in the management of acid related disorders. In fact, benzimidazole derivatives had found their applications as antioxidant , antimicrobial , antihelmintic , anticancer , antiviral , antiallergic , antiarthritic  and anti-mycobacterial agents . In light of above, the present study was undertaken to synthesise and evaluate the antimicrobial and anticancer potentials of substituted benzimidazole derivatives. Target compounds (1–30) were synthesized by following procedure outlined in Scheme 1. The physicochemical data of the target compounds are presented in Table 1. The synthesized compounds were evaluated on the basis of spectral analysis: IR, NMR and Mass and elemental analyses which were in full agreement with their proposed molecular structures. The formation of Schiff bases is confirmed by the presence of N=CH str., at around 1560 cm−1 in the IR spectra of synthesized compounds (1–11). Asym str., at around 1550 cm−1 indicated the presence of aromatic nitro group in 5, 7, 13, 14, 16, 21-28 compounds. The presence of C–O–C str., of aralkyl showed methoxy group in 3, 9, 11, 13, 17–20, 27 compounds. The C–H str., at 1727 cm−1 confirmed the aliphatic aldehyde group in 10, 14 and 15 compounds. Furthermore, the appearance of C=O str., at 1660 cm−1 and the absence of NH str., of imidazole at 3400 cm−1 confirmed the synthesis of methanone derivatives (12–30). The multiplet corresponds to 6.697–7.823 δ ppm confirmed the presence of aromatic protons of aryl nucleus and benzimidazole. The appearance of singlet at around 9.580 δ ppm confirmed the Schiff bases (N=CH–). The singlet peak at 3.426 δ ppm indicated the presence of dimethyl group in compounds, 1, 6, 22, 29 and 30. The doublet peak observed at 1.273–1.276 δ ppm which confirmed the presence of aliphatic methyl group in the synthesized compounds, 8, 12 and 15. The multiplet showed at 1.243–2.496 δ ppm confirmed the presence of CH2 chain of palmitoyl group in the structure of compounds (20, 28 and 29). Further confirmation was made on the basis of 13C-NMR and MS spectral analyses. The results of C, H, N analysis are within limits of ± 0.3%. The synthesized benzimidazole derivatives were screened for their anticancer activity against MCF7 (ATCC HTB-22), an oestrogen receptor positive human breast adeno-carcinoma cell line. Anticancer screening results (Table 2) indicated that compound 22 (IC50 = 0.9 µM) was found to be the most potent when compared to the standard drug, 5-fluorouracil (IC50 = 35.4 µM). Other compounds which included 12, 21 and 29 also exhibited more potent antiproliferative results (IC50 = 7.0, 5.4 and 5.5 µM, respectively) when compared to the standard drug. These compounds may be used as drug leads for discovery of new anticancer agents. Antimicrobial activity results (Table 3) indicated that the compounds possessed good antimicrobial activity against the tested bacterial and fungal strains. Compound 1 showed good antibacterial activity against E. coli (MICec = 5.4 µM) and B. subtilis (MICbs = 10.7 µM), whereas compound 19 was found to be more potent against S. aureus (MICsa= 12.4 µM). The reference drug, norfloxacin, yielded MIC of 4.7 µM against the tested microorganisms. The antifungal activity results indicated that compound 2 showed good activity against C. albicans (MICca = 5.4 µM. Compound 19, on the other hand, was the most potent antifungal agent against A. niger (MICan = 3.1 µM) in comparison to fluconazole (MIC = 5.0 µM), the reference drug. Thus, compound 19 may serve as a potential lead compound for the design of novel antifungal agents. It has been noticed that the antibacterial activity of Schiff bases against E. coli enhanced due to the presence of vinyl group between benzimidazole amine and N-benzylidene moiety and the substitution of electron releasing group at phenyl nucleus as in the compound 1 and the same moiety improved anticancer activity of methanone derivatives as in compound 22. The electron donating group placed at phenyl ring attached to N-alylidene/arylidene moiety along with presence of electron withdrawing group on phenyl ring attached to methanone moiety improved antibacterial and antifungal activity of synthesized benzimidazole derivatives against bacterial and fungal strains as in compound 19. 13C NMR spectra of the synthesized compounds were recorded on Bruker Advance-II 400 NMR spectrometer with DMSO as a solvent and the chemical shift data were expressed as delta values related to tetramethylsilane. Mass spectra were recorded using Waters, Q-TOF micromass spectrometer. 2-Aminobenzimidazole (0.01 mol) was refluxed with different substituted aromatic aldehyde (0.01 mol) in ethanol (20 ml) for 4–5 h (RT) in presence of glacial acetic acid (few drops). Then the reaction mixture was allowed to cool at RT and the precipitated compound was filtered and dried . Compound of Schiff’s bases (1–11) (0.005 mol) were stirred at RT with different acylchlorides (0.005 mol) in dimethylformamide for 24 h with the addition of small amount of triethylamine. The resulting reaction mixture was precipitated using ice cold water and the crude product was filtered through a vacuum pump, washed with cold water, dried and recrystallized using rectified spirit . IR (KBr cm−1): 1550 (N=CH str. ), 3475 (N–H str. ), 1431 (Ar., C=C str. ), 1253 (C–N str. ), 1300 (–N(CH3)2 str); 1H NMR (DMSO): 9.557–9.575 (d, 1H, N=CH), 6.646–6.714 (d, 1H, –CH=CH), 6.416–7.614 (m, 8H, ArH), 3.426 (s, 6H, (CH3)2); 13C NMR (DMSO): 40, 115, 119, 123, 127, 135, 138, 148, 159, 162; MS: m/z = 291.12 (M+ +1). IR (KBr cm−1): 3066 (N–H str., of imidazole), 3012 (C–H aromatic ring str. ), 1442 (Ar., C=C str. ), 1550 (N=CH str. ), 1253 (C–N str. ), 3518 (O–H str. ); 1H NMR (DMSO): 10.295 (s, 1H, N=CH), 7.096–8.108 (m, 10H, ArH), 4.481 (s, 1H, OH), 10.809 (s,1H, NH of imidazole); 13C NMR (DMSO): 115, 118, 123, 127, 128, 129, 132, 135, 138, 159, 162; MS: m/z = 288.39 (M+ +1). IR (KBr cm−1): 3410 (N–H str. ), 3058 (Ar., C–H str. ), 1542 (C=C str. ), 1610 (N=CH str. ), 2827 (Ar., OCH3 str. ); 1H NMR (DMSO): 9.487 (s, 1H, N=CH), 6.982–7.849 (m, 7H, ArH), 10.452 (s, 1H, NH of imidazole) 3.502 (s, 6H, (OCH3)2); 13C NMR (DMSO): 56, 115, 123, 127, 138, 152, 159, 162; MS: m/z = 282.14 (M+ +1). IR (KBr cm−1): 3440 (N–H str. ), 3063 (Ar., C–H str. ), 1537 (C=C str. ), 1613 (N=CH str. ), 3452 (O–H str. ); 1H NMR (DMSO): 9.582 (s, 1H, N=CH), 7.106–8.367 (m, 8H, ArH), 10.809 (s, 1H, NH of imidazole); 13C NMR (DMSO): 115, 117, 123, 126, 129, 131, 138, 159, 162; MS: m/z = 238.17 (M+ +1). IR (KBr cm−1): 3240 (N–H str., of imidazole ring), 2974 (C–H aromatic ring str. ), 1465 (Ar., C=C str. ), 1550 (N=CH str. ), 1548 (Ar–C–NO2, asym str. ); 1H NMR (DMSO): 9.550 (s, 1H, N=CH), 7.103–8.105 (m, 4H, ArH), 8.116–8.376 (d, 4H, Ar-NO2), 12.73 (s, 1H, NH of imidazole); 13C NMR (DMSO): 115, 120, 123, 130, 138, 149, 159, 162; MS: m/z = 267.26 (M+ +1). IR (KBr cm−1): 1550 (N=CH str. ), 3374 (N–H str. ), 1462 (Ar., C=C str. ), 1298 (C–N str. –N(CH3)2); 1H NMR (DMSO): 9.206 (s, 1H, N=CH), 6.697–7.823 (m, 8H, ArH), 3.043 (s, 6H, (CH3)2), 12.42 (s, 1H, NH of imidazole); 13C NMR (DMSO): 40, 115, 123, 138, 159, 162; MS: m/z = 265.35 (M+ +1). IR (KBr cm−1): 3428 (N–H str. ), 3068 (Ar., C–H str. ), 1531 (C=C str. ), 1618 (C=N str. ), 1547 (Ar-NO2 str. ); 1H NMR (DMSO): 9.515 (s, 1H, N=CH), 7.213–8.378 (m, 8H, ArH), 10.23 (s, 1H, NH of imidazole); 13C NMR (DMSO): 115,123, 127, 135, 138, 150, 159, 162; MS: m/z = 267.28 (M+ +1). IR (KBr cm−1): 3267 (N–H str., of imidazole ring), 2924 (C–H aromatic ring str. ), 1465 (Ar., C=C str. ), 1550 (N=CH str. ), 2877 (R-CH3, sym str. ); 1H NMR (DMSO): 8.654 (s, 1H, N=CH), 6.897–7.143 (m, 4H, ArH), 1.243 (s, 3H, CH3); 13C NMR: 22, 111, 120, 154, 175. MS: m/z = 160.28 (M+ +1). IR (KBr cm−1): 3340 (N–H str., of imidazole ring), 2970 (C–H aromatic ring str. ), 1496 (Ar., C=C str. ), 1566 (N=CH str. ), 1257 (C–O–C str. ); 1H NMR (DMSO): 9.383 (s, 1H, N=CH), 7.027–7.960 (m, 8H, ArH), 3.523 (s, 3H, OCH3), 12.497 (s, 1H, NH of imidazole); 13C NMR (DMSO): 57, 114, 115, 123, 126, 130, 138, 162; MS: m/z = 252.28 (M+ +1). IR (KBr cm−1): 3426 (N–H str. ), 3054 (Ar., C-H str. ), 1562 (C=C str. ), 1623 (N=CH str. ), 2773 (Aliphatic C–H str. ), 1724 (Aliphatic aldehyde C=O str. ); 1H NMR (DMSO): 8.454 (t, 1H, N=CH), 6.856–7.143 (m, 4H, ArH), 1.243–2.567 (m, 6H, CH2), 9.700 (t, 1H, CH = O); 13C NMR (DMSO): 18, 28, 44, 115, 123, 138, 160, 162, 202. MS: m/z = 216.26 (M+ +1). IR: 3429 (N–H str. ), 3064 (Ar., C–H str. ), 1577 (C=C str. ), 1606 (N=CH str. ), 2835 (Ar., O–CH3 str. ); 1H NMR (DMSO): 9.476 (s, 1H, N=CH), 6.962–7.859 (m, 6H, ArH), 10.462 (s, 1H, NH of imidazole) 3.382 (s, 9H, (OCH3)3); 13C NMR (DMSO): 56, 106, 115, 123, 127, 138, 141, 152, 159, 162; MS: m/z = 312.14 (M+ +1). IR (KBr cm−1): 1661 (C=O str. ), 2919 (C–H aromatic str. ), 1575 (N=CH str. ), 2849 (CH str. (sym), R-CH3); 1H NMR (DMSO): 7.305–7.627 (m, 4H, Ar–H), 7.233 (s, 1H, N=CH), 1.273–1.276 (d, 3H, CH3), 2.856 (s, 3H, CH3); 13C NMR (DMSO): 16, 24, 115, 123, 129, 138, 141, 162, 168; MS: m/z = 201 (M+ +1). IR (KBr cm−1): 1710 (C=O str. ), 2924 (C–H aromatic str. ), 1537 (N=CH str. ), 1545 (Ar-NO2 str. ), 1110 (C–O–C str., OCH3); 1H NMR (DMSO): 6.785–7.943 (m, 8H, ArH), 8.632 (s, 1H, N=CH), 2.984 (s, 3H, (OCH3), 8.912–9.063 (m, 3H, Ar(NO2)2); 13C NMR (DMSO): 56, 115, 123, 125, 130, 150, 163, 168; MS: m/z = 445 (M+ +1). IR (KBr cm−1): 1701 (C=O str. ), 3122 (C–H aromatic str. ), 1627 (N=CH str. ), 1543 (Ar., NO2 str. ), 1727 (Aliphatic aldehyde C=O str. ); 1H NMR (DMSO): 6.875-7.946 (m, 4H, ArH), 8.632 (s, 1H, N=CH), 8.912–9.063 (m, 3H, Ar(NO2)2), 9.254–9.678 (m, 1H, CHO); 13C NMR (DMSO): 19, 28, 44, 115, 123, 125, 130, 150, 163, 168; MS: m/z = 409 (M+ +1). IR (KBr cm−1): 1695 (C=O str. ), 3050 (C–H aromatic str. ), 1606 (N=CH str. ), 1535 (C-NO2 str. ), 2860 (C–H sym. str., R-CH3), 1728 (Aliphatic aldehyde C=O str. ); 1H NMR (DMSO): 7.875–8.246 (m, 4H, ArH), 7.632 (s, 1H, N=CH), 9.254–9.678 (m, 1H, CHO), 2.856 (s, 3H, CH3); 13C NMR (DMSO): 19, 24, 28, 44, 115, 123, 138, 142, 163, 168, 202; MS: m/z = 257 (M+ +1). IR (KBr cm−1): 1685 (C=O str. ), 3094 (C–H aromatic str. ), 1630 (N=CH str. ), 1544 (C–NO2 str. ), 3465 (O–H str); 1H NMR (DMSO): 6.885–7.632 (m, 8H, ArH), 8.654 (s, 1H, N=CH), 8.912–9.063 (m, 3H, Ar (NO2)2); 13C NMR (DMSO): 115, 123, 125, 130, 132, 138, 150, 160, 168; MS: m/z = 431 (M+ +1). IR (KBr cm−1): 1695 (C=O str. ), 2919 (C–H aromatic str. ), 1634 (N=CH str. ), 2850 (Ar., OCH3 str. ); 1646 (naph. ring str. ); 1H NMR (DMSO): 6.844–8.213 (m, 14H, ArH), 8.612 (s, 1H, N=CH), 2.804 (s, 6H, (OCH3)2); 13C NMR (DMSO): 56, 101, 107, 109, 115, 123, 127, 129, 132, 138, 142, 160, 168; MS: m/z = 435 (M+ +1). IR (KBr cm−1): 1691 (C=O str. ), 1548 (N=CH str. ), 1140 (C–O–C str., OCH3); 795 (C–H out of plane bending, naphthalene ring); 1H NMR (DMSO): 8.590 (s, 1H, N=CH), 4.194 (s, 9H, (OCH3)3), 6.971–8.070 (m,11H, Ar–H); 13C NMR (DMSO): 57, 107, 115, 123, 124, 127, 128, 131, 139, 142, 151, 160, 168; MS: m/z = 465 (M+ +1). IR (KBr cm−1): 1681(C=O str. ), 1539 (N=CH str. ), 2850 (CH3 sym. str., R-OCH3); 1345 (C–NO2 str. ); 1H NMR (DMSO): 8.947 (s, 1H, N=CH), 3.955 (s, 9H, (OCH3)3), 9.860–9.865 (m, 3H, Ar-(NO)2), 7.948–7.951 (d, 2H, Ar–H), 7.343–7.366 (m, 2H, Ar–H); 13C NMR (DMSO): 57, 106, 115, 125, 128, 129, 131, 139, 142, 147, 151, 168; MS: m/z = 505 (M+ +1). IR (KBr cm−1): 1685 (C=O str. ), 3061 (C–H aromatic str. ), 1623 (N=CH str. ), 2843 (Ar., O–CH3 str. ), 1266 (Palmitoyl group str. ); 1H NMR (DMSO): 7.283–7.286 (m, 6H, ArH), 1.278–2.386 (m, 28H, CH2 of palmitoyl), 0.884–0.903 (t, 3H, CH3), 3.264 (s, 9H, (OCH3)3); 13C NMR (DMSO): 14, 23, 26, 30, 32, 56, 106, 115, 123, 128, 130, 139, 142, 160, 170; MS: m/z = 549 (M+ +1). IR (KBr cm−1): 1682 (C=O str. ), 2922 (C–H aromatic str. ), 1525 (N=CH str. ), 1557 (C=C and C=N str. of pyridine ring), 1543 (C–NO2 str. ); 1H NMR (DMSO): 10.019 (s, 1H, N=CH), 7.305–8.658 (m, 15H, ArH), 8.662 (s, 1H, Ar–NO2); 13C NMR (DMSO): 115, 123, 126, 129, 130, 132, 142, 150, 155, 160, 168; MS: m/z = 447 (M+ +1). IR (KBr cm−1): 1723(C=O str. ), 2920 (C–H aromatic str. ), 1530 (N=CH str. ), 1549 (Ar-NO2 str. ), 1349 (C–N str., of ter. arylamine); 1H NMR (DMSO): 8.390–8.410 (d, 1H, N=CH), 6.731–6.740 (d, 1H, –CH = CH), 6.250–8.355 (m, 11H, ArH), 8.919 (s, 1H, Ar-NO2) 3.559 (s, 6H, (CH3)2); 13C NMR (DMSO): 40, 115, 123, 127, 131, 138, 149, 164, 168; MS: m/z = 439 (M+ +1). IR (KBr cm−1): 1719 (C=O str. ), 3085 (C–H aromatic str. ), 1615 (N=CH str. ), 1545 (Ar-NO2 str. ), 1514 (C–N str. ); 1H NMR (DMSO): 7.169–8.987 (m, 12H, ArH), 9.568 (s, 1H, N=CH), 2.909 (s, 6H (CH3)2); 13C NMR (DMSO): 40, 115, 123, 127, 131, 138, 149, 160, 168; MS: m/z = 413 (M+ +1). IR (KBr cm−1): 1696 (C=O str. ), 2924 (C–H aromatic str. ), 1553 (N=CH str. ), 1546 (Ar-NO2 str. ), 752 (O–H bending (out of plane)); 1H NMR (DMSO): 6.748–8.632 (m, 14H, ArH), 9.652 (s, 1H, N=CH); 13C NMR (DMSO):115, 118, 123, 125, 127, 128, 131, 138, 149, 160, 168; MS: m/z = 436 (M+ +1). IR (KBr cm−1): 1704 (C=O str. ), 3107 (C–H aromatic str. ), 1617 (N=CH str. ), 1549 (Ar., NO2 str. ); 1H NMR (DMSO): 7.206–8.689 (m, 12H, ArH), 9.672 (s, 1H, N=CH); 13C NMR (DMSO): 115, 121, 123, 125, 127, 131, 136, 139, 151, 160, 168; MS: m/z = 415 (M+ +1). IR (KBr cm−1): 1686 (C=O str. ), 3056 (C–H aromatic str. ), 1600 (N=CH str. ), 1545 (Ar., NO2 str. ), 1592 (Naphthalene ring str. ); 1H NMR (DMSO): 6.865–7.954 (m, 11H, ArH), 8.765 (s, 1H, N=CH), 8.923–8.967 (m, 4H, Ar(NO2); 13C NMR (DMSO): 115, 123, 124, 128, 129, 131, 135, 136, 139, 142, 149, 160, 168; MS: m/z = 420 (M+ +1). IR (KBr cm−1): 1684 (C=O str. ), 1611 (N=CH str. ), 2875 (Ar., O–CH3 str. ); 1543 (Ar., NO2 str. ); 1H NMR (DMSO): 7.463–8.932 (m, 11H, ArH), 8.185 (s, 1H, N=CH), 2.904 (s, 6H, (OCH3)2); 13C NMR (DMSO): 56, 115, 123, 125, 127, 136, 139, 142, 147, 150, 152, 160, 168; MS: m/z = 430 (M+ +1). IR (KBr cm−1): 1685 (C=O str. ), 2954 (C–H aromatic str. ), 1618 (N=CH str. ), 1271 (Palmitoyl group. str. ), 1547 (Ar-NO2str. ); 1H NMR (DMSO): 7.624–8.163 (m, 8H, ArH), 8.672 (s, 1H, N=CH), 1.243–2.496 (m, 28H, CH2 of palmitoyl), 0.845–0.878 (t, 3H, CH3); 13C NMR (DMSO): 14, 23, 26, 30, 32, 56, 106, 115, 120, 123, 125, 128, 131, 135, 136, 139, 142, 149, 160, 170; MS: m/z = 504 (M+ +1). IR (KBr cm−1): 2927 (C–H, aromatic str. ), 2813 (C–H str. aliphatic), 1659 (C=O str. ), 1594 (N=CH str. ), 1303 (C–N str. ), 1278 (palmitoyl group str. ); 1H NMR (DMSO): 7.878–7.901 (d, 1H, N=CH), 6.606–6.622 (d, 1H, –CH = CH), 6.661–7.519 (m, 8H, ArH), 3.773 (s, 6H, (CH3)2), 1.252–2.368 (m, 28H, CH2 of palmitoyl), 0.861–0.894 (t, 3H, CH3); 13C NMR (DMSO): 14, 23, 26, 30, 32, 56, 106, 115, 120, 123, 125, 128, 130, 139, 142, 149, 164, 170; MS: m/z = 528 (M+ +1). IR (KBr cm−1): 1683 (C=O str. ), 3054 (C–H aromatic str. ), 1608 (N=CH str. ), 1521 (Ar. NO2 str. ), 1448 (C–N str. ), 778 (C–H out of plane bending, naphthalene ring); 1H NMR (DMSO): 6.668–7.985 (m, 15H, ArH), 9.584 (s, 1H, N=CH), 2.909 (s, 6H (CH3)2); 13C NMR (DMSO): 40, 115, 123, 124, 128, 130, 139, 142, 160, 168; MS: m/z = 418 (M+ +1). Tube dilution method  was used to determine the antimicrobial activity of synthesized compounds against Gram-positive bacteria: Staphylococcus aureus (MTCC-3160); Bacillus subtilis (MTCC-441), the Gram-negative bacterium Escherichia coli (MTCC-443) and fungal species: Candida albicans (MTCC-227) and Aspergillus niger (MTCC-281). Dilutions were made for test and standard compounds in appropriate double strength nutrient broth—I.P. (bacteria) or Sabouraud dextrose broth—I.P. (fungi) . The test and standard compounds were incubated at 37 °C for 24 h (bacteria), at 25 °C for 7 days (A. niger) and at 37 °C for 48 h (C. albicans) and the minimum inhibitory concentration (MIC) was recorded in µg/mL. 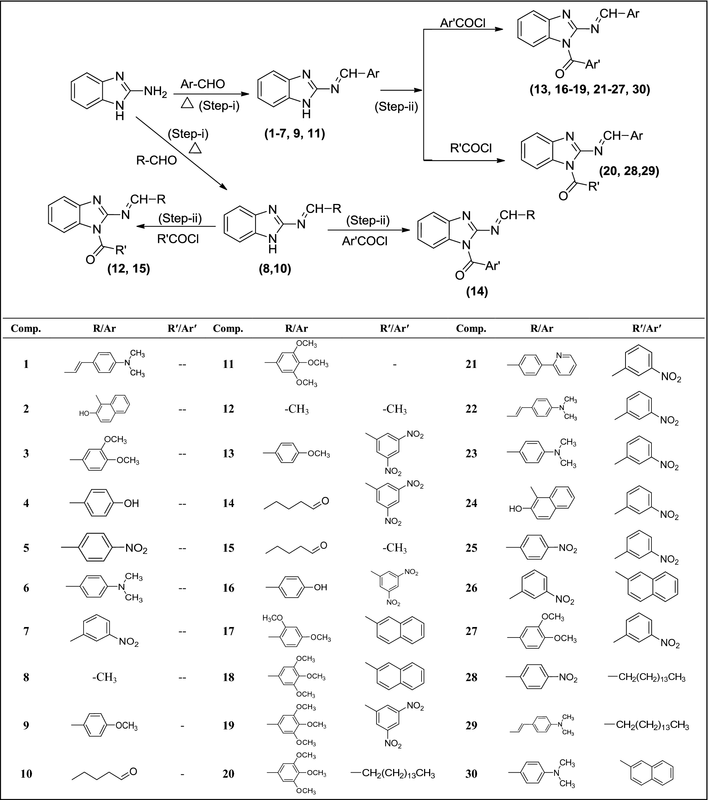 The in vitro anticancer activity of the developed compounds was performed by the Sulforhodamine B (SRB) assay as described by Skehan et al. . The optimal MCF-7 cell count was seeded on flat-bottom well plates and allowed to attach overnight. The compounds (20 μL) were added in quadruplicates and incubated for 72 h (both drug-free control and treated cells). Cells in each well were fixed with 200 μL of 10% cold trichloroacetic acid. After incubation for 30 min, the individual wells were rinsed with water, allowed to stain in 100 µL 0.4% SRB [Sigma-Aldrich, St Louis, Missouri, USA] (w/v; in 1% acetic acid) for 15 min. The air-dried plates were placed on a plate shaker and bound SRB was solubilised in 100 µL 10 mM Tris base solution. Absorbance was measured using a spectrophotometer at 570 nm and a dose–response curve was plotted from which the IC50 value of each compound against each cell type was determined. In conclusion, a series of 1,2-disubstituted benzimidazole derivatives were synthesized and assessed for in vitro antimicrobial and anticancer activities against five representative microbial species and cancer cell line. Antimicrobial activity results indicated that the synthesized compound 1 has promising activity towards Gram negative bacteria E. coli. None of the compound showed more potent activity against Gram positive bacteria B. subtilis and S. aureus when compared to reference drug norfloxacin. Moreover, compounds 2 and 19 showed interesting results against fungal strains C. albicans and A. niger and comparable to fluconazole. The results from anticancer activity indicated that compounds 12, 21, 22 and 29 showed promising activity against MCF7. These active compounds may be taken as lead compounds for discovery of novel antimicrobial and anticancer agents in future. SSS, BN, NV and SK have designed, synthesized and carried out the antimicrobial activity and SML, SAAS, KR and VM have carried out the spectral analysis, interpretation and cytotoxicity study of synthesized compounds. All authors read and approved the final manuscript. The authors are thankful to the Dean, University School of Chemical Technology, IP University, New Delhi and Head, Department of Pharmaceutical Sciences, M.D. University, Rohtak, for providing necessary facilities to carry out this research work.